I have a few of my grandmother's handwritten recipe cards. In a sense, I'm glad I do, but in another sense, they are almost unbearably poignant. I agree, Niobe. One of my most cherished possessions is a handwritten recipe for banana bread from my grandma. She wrote it for me as she showed me, step by step, how to make it. Chamber pot? I am not sure I will be able to look at lasagna the same way now. They tossed her recipes? Dude. What is wrong with those people? In my husband's family people fought over it. You have to wonder how they pronounced the G.
La Sagna is t he be st with a n ice sal ad. "Let simmer!" You've got to wonder about that exclamation point. I LOVE this. La Love. I am going to work hard on forgetting that chamber pot reference. You know, the next time I eat a hearty serving of la sagna. 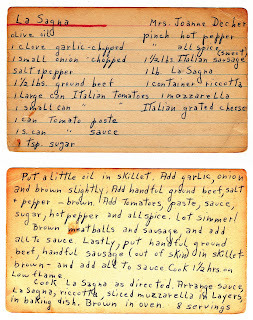 My grandmother's recipes that I have are all in my handwriting-- dictated over the phone. The saddest part of this story, for me, is that her children didn't want the recipes. I see it as a kind of deep rejection. Especially after that post on family cookbooks My Reality wrote so recently. OK, I started this post thinking, there can't be anything sadder in life than those recipes getting thrown away... and then came the chamber pot thing. It's all about perspective, isn't it?